The date "c. 1900" was not understood. The item is timber and box shaped measuring 26.5cm x 19cm x 9cm. 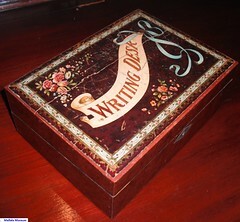 On the lid, prettily decorated with roses, there is a large scroll with the words 'Writing Desk'. When opened the extension enables a sloped velvet-covered writing surface to come into use. The interior contains an ink bottle and pen compartment. Writing boxes became popular with the development of paper and the improvement of writing materials. An organised postal system that introduced mail coaches and set up the post offices in settlements stimulated written communication. In 1911, when penny postage was introduced throughout the Empire, letter writing was more affordable for the average person. 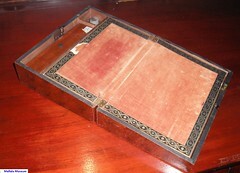 The writing slope was a personal item belonging to Amelia White who was Headteacher at the Barabba School. 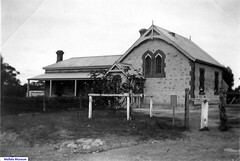 Amelia White was accompanied by her mother Mrs White and her sister Miss Emily White when she was tranferred from Watts Range School to her appointment at Barabba. 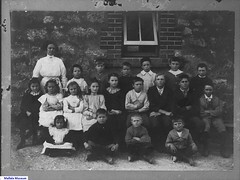 Miss White lived in the school house and was postmistress as well, conducting the Post Office duties from the pantry of the schoolhouse. 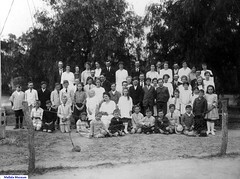 For 28 years Amelia White encouraged and prepared the pupils at the Barabba School for many events and activities that were celebrated as part of the community life in the area. Do you remember Writing slope ? Then Join up and add your memory here.